Hey, Nashville, did you know you had a women’s rugby team? It’s true! And not only do you have a rugby team, you have a CHAMPIONSHIP rugby team. Last year, Nashville’s Stone Lions beat out both Memphis and Louisiana to win the True South Championships. In May they’ll go up against the rest of the region in the South Championship. Rad! I got to talk broken bones and bruises with Stone Lions captains Kellie Hurst (left) and Regina Durkan (right) for this week’s People Issue, and the team was also kind enough to let Matthew J. Nemer and our own Stephen Trageser take some video at one of their recent practices. Watch the above video to see just how badass they are! Rugby players are some of the world’s toughest athletes. When members of The Stone Lions, the Nashville Women’s Rugby Club, met up for one of their first biweekly practices of the 2015 season, it was literally freezing outside and the ground was dangerously soggy from the several inches of rain that had recently caused flood warnings throughout Middle Tennessee. But the women still fearlessly threw their bodies against the ground and each other. “You have to get used to falling!” hollered coach Kathleen O’Neill. The hard work has paid off — in May they’ll compete in the USA Rugby South Championships in Augusta, Ga. Here co-captains Kellie Hurst and Regina Durkan speak to the Scene about broken bones and the upcoming season while warming up. How long have you been playing rugby, and what about the sport appealed to you? KH: I’ve been playing for six years. The first time rugby had been introduced to me was in high school. I had been doing track and weightlifting, but I was like “That looks fun, a team sport.” And who doesn’t want to tackle someone? What are some of the worst injuries you’ve suffered? RD: That’s the fun part after games, to compare bruises. I just had ACL reconstruction, but that was from just sprinting on my own [laughs]. The boys always have the gnarliest ones. Ours haven’t been that bad, nothing that would take you out completely. It seems like you’re trying to not scare people away from maybe joining you. KH: We saw a girl’s arm where, literally, you saw a gap in her arm. [Another teammate] had one of the worst ones — when we were at the championship game last May, her tibia and fibula broke. That was just from running, that wasn’t even a tackle. RG: When they were carting her off the field she didn’t look upset or anything. She’s like, “You better win now!” And we did! KH: I did track and weightlifting, but now it’s just rugby. RG: I did rock climbing. RG: Yeah, I’m a little masochistic, I guess [laughs]. But they’re fun. You have health insurance, right? RG: Oh yeah. A very rewarding experience this past December, getting health insurance. Do you remember your first tackle? RG: Yes I do. I was in college; it was against Memphis. Memphis is a woman’s club, and there are a lot of bigger girls. And I was just this skinny little college player, and I found the biggest girl I could tackle. I just wrapped around her ankles, and you can’t really move after that. 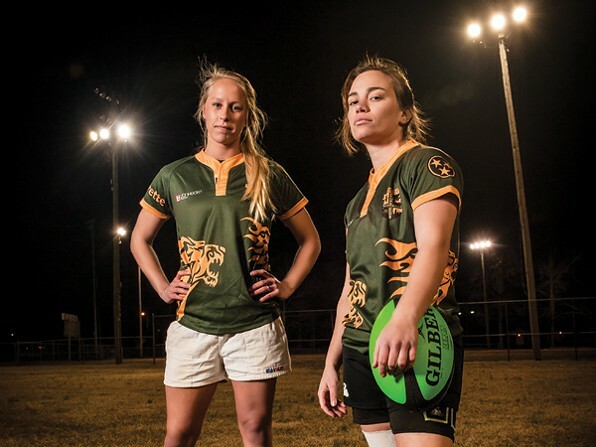 No Replies to "Meet Nashville Women's Rugby Captains Kellie Hurst and Regina Durkan"
Stone Lions Rock Double-Header Season Opener!